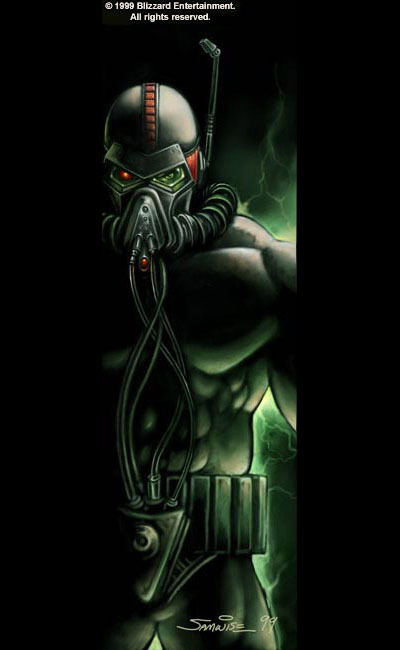 Ghosts are Psychic Special Ops – commandos, rangers, and snipers, able to psionically cloak themselves in their specially-designed combat suits. The following template is a basic Ghost … in an all-Ghost (i.e. 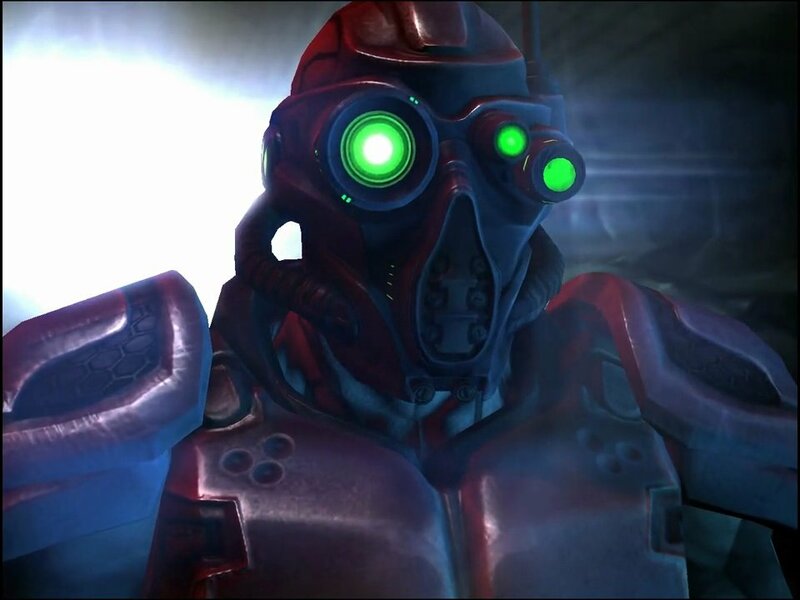 SpecOps team) campaign, Ghost PCs will usually have 100-200 points' worth of additional psionic abilities, cyberware, training (see Ghost Lenses, below), or other abilities (e.g. marine template traits). Add the Powered Infantry Officer or Senior NCO to create a higher-ranking Ghost. Attributes: ST 13 ; DX 15 ; IQ 12 ; HT 13 . Secondary Characteristics: Damage 1d/2d-1; BL 34 lbs. ; HP 15 ; Will 13 ; Per 13 ; FP 13 ; Speed 7.00 ; Move 7 . Advantages: Combat Reflexes ; Fit ; Military Rank 1 (Corporal) ; Quick Reload (Detachable Magazine) ; Unusual Background (Psionic Potential) . Psionics: Detect (Psionic Energy; Psionic, -10%; Vague, -50%) ; Invisibility (Affects Machines, +50%; Can Carry Objects, Medium Enc, +50%; Psionic, -10%; Switchable, +10%) ; Mind Reading (Psionic, -10%) . Disadvantages: Code of Honor (Soldier's) [-10]. • One of Callous [-5], Loner [-5], Odious Personal Habits (Blurts out people's private thoughts, etc) [-5], or similar mental disadvantage. • Another -25 points chosen from among Bloodlust [-10], Curious [-5] or Incurious [-5], Gluttony [-5], Guilt Complex [-5], Gullibility [-10], Hidebound [-5], Impulsive [-10], Intolerance (Protoss or Zerg) [-5] or (Non-Terrans)[-10], Overconfidence [-5], Sense of Duty (Teammates) [-5], Stubbornness [-5], or other non-crippling mental disadvantages. Primary Skills: Fast-Draw (Ammo) (E) DX+1 -16; Guns (Rifle) (E) DX+2 -17; Guns (Shotgun or SMG, from default) (E) DX+1 -16; Stealth (A) DX+2 -17; Tactics (H) IQ -12. Secondary Skills: Battlesuit (A) DX+2 -17; Climbing (A) DX -15; Electronics Operation (Comms and Psychotronics), both (A) IQ -12; Expert Skill (Psionics) (H) IQ -12; Hiking (A) HT -13; Judo (H) DX -15; Jumping (E) DX -15; Karate (H) DX -15; Knife (E) DX -15; First Aid (E) IQ -12; Forward Observer (A) IQ -12; Gesture (E) IQ -12; Mental Strength (E) Will+1 -14; Mind Block (A) Will -13; Observation (A) Per -13; Running (A) HT -13; Savoir-Faire (Military) (E) IQ -12; Soldier (A) IQ -13; Spacer (E) IQ -13; Swimming (E) HT -13; Throwing (A) DX -15. • Six of Armoury (Battlesuits, Body Armor, or Small Arms), Artillery (Guided Missile), Electronics Operation (Security, Sensors, or Surveillance), Explosives (Demolitions), Lockpicking, Mechanic (any known Driving or Piloting specialization), or Navigation (Land), all (A) IQ ; Intimidation (A) Will ; Driving (Automobile, Heavy Wheeled, Hovercraft, Mecha, or Motorcycle) or Piloting (Aerospace or Vertol), all (A) DX ; Gunner (Beams, Cannon, Machine Gun, or Rockets) or Guns (GL or LAWS), all (E) DX+1 ; Meditation (H) Will-1 -11; or Survival (Low/No Atmosphere or Toxic Atmosphere) (A) Per (A) . Background Skills: Computer Operation (E) IQ . • Another 4 points chosen from among Carousing (E) HT ; Connoisseur (any) (A) IQ-1 ; Current Affair (any), Games (any), or Hobby Skill (any), all (E) IQ ; Gambling (A) IQ-1 ; Scrounging (E) Per ; or other background/hobby skills. Standard Loadout: Ghost HES; Neosteel Boot Knife; Neosteel Combat Knife. • One sniper rifle: Anti-Material Rifle (15mm), Payload Rifle (25mm), or Portable Railgun (20mm). • One sidearm: Gauss Heavy Machine Pistol (8mm) or Gauss Shotgun Pistol (18.5mm). Suit + 55 lbs (No Encumbrance). A Ghost team's designated pilot must be proficient in an array of vehicles – whatever's needed to get the team in to and out of trouble. See "One With the Ship," Pyramid 3/30, for Psionic Vehicular Possession. Advantages: Military Rank 2 (Warrant Officer) ; Pilot's Instincts 4† . • Another 45 points chosen from among Pilot template traits. Skills: Electronics Operation (Sensors) (A) IQ-1 -12 (+4*). • 4 points chosen from among Driving (Heavy Wheeled, Hovercraft, Mecha, or Tracked) or Piloting (Aerospace or Vertol), all (A) DX+3 -18*. • Another 5 points chosen from additional Driving or Piloting, Artillery (Cannon or Guided Missile) or Electronics Operation (EW), both (A) IQ-1 -12 (+4*); Gunner (Beams, Cannon, Machine Gun, or Rockets) (E) DX -15 (+4*); or Navigation (Air, Hyperspace, Land, or Space) (A) IQ-1 -12. *Pilot's Instincts adds to all forms of Driving and Piloting, as well as all forms of Artillery, Electronics Operation, and Gunner, but only when operating vehicular systems while driving or piloting. A Ghost science officer often doubles as a field medic, but his primary role is to collect field samples, conduct analysis, and advise command on matters within his expertise. Secondary Characteristics: Will -1 [-5]; Per -1 [-5]. Advantages: Field Medic 2* ; Military Rank 2 (Lieutenant) . • Another 35 points chosen from among Combat Medic (Physician-1) , Field Medic 3-4 [5/level], or Medic template traits. Skills: Biology (Exobiology and Terran) and Surgery, all (VH) IQ-2 -12; Chemistry, Diagnosis, Pharmacy (Synthetic), and Physician, all (H) IQ-1 -13; Electronics Operation (Medical and Scientific) and Research, all (A) IQ -14. *Field Medic adds to Diagnosis, First Aid, Pharmacy, Physician, Physiology, and Surgery. Standard Loadout: Add Scientist's Computer and Medic's Kit (+20 lbs). All Ghosts are scouts and snipers, so the Scout Sniper has to be that much better at scouting and sniping than everyone else on the team. Secondary Characteristics: Per +3 ; Move +2 . Advantages: Gunslinger ; Patience of Job ; Weapon Bond (Primary sniper rifle) . Skills: Zen Marksmanship (Rifle) (VH) IQ+3 -15. • Improve to Guns (Rifle) (E) DX+4 -20, for 8 points. Standard Loadout: As normal, but most Scout Snipers name their rifles. A Ghost techie not only conducts field repairs on team equipment, but pinch-hits as a hacker and electronics wiz as needed for covert intrusion. Advantages: Born to be Wired 2* ; Quick Gadgeteer (No New Inventions) ; Ultra-Techie 2† . Skills: Computer Hacking (VH) IQ+1 -15*; Computer Programming, Cryptography, and Expert Skill (Computer Security), all (H) IQ+1 -15*; Armoury (Body Armor and Small Arms), Electronics Repair (Psychotronics and Security), all (A) IQ+1 -15†; Electronics Operation (Security) and Lockpicking, both (A) IQ -14; Scrounging (E) Per+1 -15. • Another 5 points chosen from among Electrician, Electronics Repair (Comms, Computers, Scientific, or Sensors), Machinist, or Mechanic (Aerospace, Automobile, Flight Pack, Heavy Wheeled, Hovercraft, Jet Aircraft, Mecha, Motorcycle, Tracked, or Vertol), all (A) IQ+1 -15†; or Electronics Operation (Scientific or Sensors), (A) IQ-1 -13. *Born to be Wired adds to Computer Hacking, Computer Operation, Computer Programming, Cryptography, Electronics Repair (Computers), and Expert Skill (Computer Security). †Ultra-Techie adds to Armoury, Electrician, Electronics Repair, Engineering, Machinist, and Mechanic. Standard Loadout: Add a Hacker's Rig (+20 lbs). Monowire weapon are deadly even to heavily armored foes, but it takes a special kind of crazy to take a sword onto an ultra-tech battlefield. The ability to turn invisible help, though. Secondary Characteristics: Basic Speed +0.75 ; Move +1 . Advantages: Daredevil ; Weapon Bond (Primary melee weapon) ; Weapon Master (Katana or Monowire Whip) . • Either Grip Mastery (Katana)  or Reach Mastery (Monowire Whip) . Skills: Either Broadsword (A) DX+5 -20 or Monowire Whip (H) DX+4 -19. • Acrobatics (H) DX-1 -15; Fast-Draw (Monowire Whip or Sword) (E) DX+1 -17*. *Includes +1 from Combat Reflexes. Standard Loadout: Add Monowire Katana or Monowire Whip.